The chemically modified guar gum sulphonic acid (GSA) resin was used for removal and pre-concentration of Zn2+, Cd2+, Fe2+, Pb2+ and Cu2+ ions in aqueous solutions and steel industry effluent from Jodhpur, India. This type of ion exchange resin represents a new class of hybrid ion exchangers with higher stability, reproducibility and selectivity for toxic metal ions. The characterisation of the resin was carried out by determining the ion exchange capacity, elemental analysis, FT-IR spectra and thermal analysis (TGA). The distribution coefficients (Kd) of toxic metal ions were determined for different pH values. The adsorption of different metal ions on GSA resin follows the order: Cu2+ > Fe2+ > Zn2+ > Cd2+ > Pb2+. The adsorbency of different metal ions on the GSA resin was studied for up to 10 cycles. Water pollution caused by toxic metal ions from various industrial effluents has attracted great attention worldwide. A number of regulatory agencies have endeavoured to restrict the discharge of untreated metal-containing effluents into public sewers, rivers, the sea and onto land. The removal of toxic metal ions is very important due to their toxic nature in water, posing serious hazards to human health as well as to other living organisms. Therefore, it is essential to improve methods for the removal of metal ions to decrease the pollution load on the environment. Different methods, such as precipitation (Harper and Kingham, 1992), solvent extraction (Kiezyk and Mackay, 2009; Rios et al., 2010) chemical and electrochemical techniques (Diasz et al., 2009), advanced oxidation processes (Kepa et al., 2008; Diwani et al., 2009), ion-exchange methods (Saha et al., 2000; Wang et al., 2002; Singh and Saraf, 2009; Das et al., 1999; Lata et al.,2003), ultrafiltration and reverse osmosis (Rengaraj et al., 2001; Yurlova et al., 2002; Benito and Ruiz, 2002) have been developed for the removal of toxic metal ions from industrial effluents and wastewater. A major drawback with precipitation is sludge production. Adsorption using commercial activated carbon (CAC) can remove toxic metal ions from wastewater, such as Cd (Ramos et al., 1997), Ni (Shim et al., 2001), Cr (Ouki and Neufeld, 1999) and Cu (Monser and Adhoum, 2002). However, CAC remains an expensive material for toxic metal removal. The resins prepared with DVB-styrene backbone are hydrophobic (Sarin et al., 1980). Also these resins are prepared from petrochemicals, which are very costly. The ion exchange capacity of these resins depends mainly on the quantity of functional groups and the pH of the solution. The most widespread chelating functional groups are: thiol (Kantipuly et al., 2001), thiourea (Hubicki and Leszczynska, 2009), dithizone (Chwastowska and Kosiarska, 2001; Shah and Devi, 1998; Chwastowska et al., 2004) and triisobutyl phosphine sulfide (Hidalgo et al., 2001; Sanchez et al., 2001), which are used for the removal of toxic metal ions from effluent; slow adsorption kinetics is one of their undesired characteristics. Ion-exchangers of polyvalent metals often exhibit much better ion-exchange behaviour and are always of interest because of their higher selectivity, resistance to higher temperatures , and to some extent chemical stability, than those of commercial ion-exchange resins (Vesely and Pekark, 2001; Inoue, 2003). Inorganic ion-exchange materials have also been established to have applications in various disciplines, i.e. environmental studies, medical science (kidney dialysis), ion-selective electrode preparation (Hassan et al., 2000), heterogeneous solid-state membrane formation, pre-concentration and ion-exchange fibre preparation. Inorganic-organic materials are known to have a large selectivity for mono- and multivalent cations (Maya, 2003; Clearfield, 2001; Khan and Mezbaul Alam, 2003; Khan et al., 2004; Amicangelo and Leenstra, 2005; Patel et al., 2006). The increasing number of publications on adsorption of toxic compounds by modified polysaccharides indicates a recent increase in interest in the synthesis of new low-cost adsorbents used in wastewater treatment (Crini, 2005). Recent developments have focused on the synthesis of adsorbents containing polysaccharides, in particular modified biopolymers derived from chitin (Santoset et al., 2007), chitosan (Wan Nagh et al., 2002), starch (Crini et al., 2005), cellulose (El- Mensnawy et al., 2008; Gupta et al., 2002) and cyclodextrin (Kozlowski et al., 2005), which are not only eco-friendly and cost-effective but are also effective in remediation of common effluents present in the wastewater. Guar gum is a polysaccharide-galactomannan obtained from the seeds of the leguminous arid plant Cymopsis tetragonolobus. The ratio of mannose to galactose is 2:1. 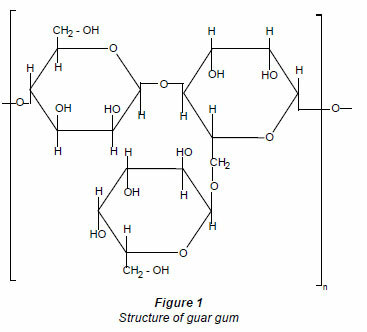 The structure of guar gum is shown in Fig. 1. Chauhan et al. 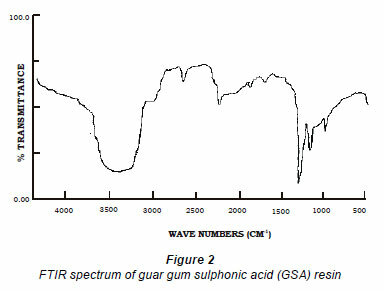 (2009) studied the synthesis and characterisation of novel guar gum hydrogels and their use as Cu(II) sorbent (Chauhan et al., 2009). Synthesis of a guaran-sulphonic acid cation-exchanger and its application in metal ion removal from underground mine-water of the Rajpura Dariba Mines, Udaipur, India, was reported by Singh et al. (1996). A hydrophilic polysaccharide matrix of guaran has been used for the preparation of some new chelating resins, after its cross linking with epoxychloropropane (Ahuja and Rai, 1997). The ion exchangers based on guar gum powder are hydrophilic and biodegradable, whereas other ion exchangers are prepared from petrochemical products which are not hydrophilic and biodegradable. Due to rising prices of petroleum products the guar gum powder has been selected for development of guar gum sulphonic acid (GSA) resin, the cost of which is very low, because it is locally available in large quantities from agriculture resources. These biopolymers are also environmentally friendly. 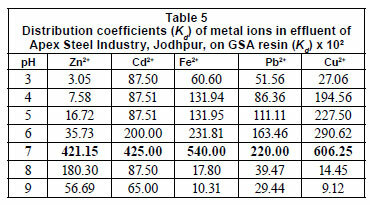 In this work, the synthesis and characterisation of GSA resin and its applications for removal and recovery of toxic metal ions from reference solution and effluent of Apex Steel Industry, Jodhpur, India, is described. The effects of pH, agitation speed, treatment time, flow rate, contact time, temperature and adsorbent dose, on the removal of metal ions from industrial effluent, were investigated. Materials used were as follows: guar gum powder (Ases Chemical Works, Jodhpur, India); epoxychloropropane (Aldrich, USA); sulphonic acid (Loba Chemic Pvt Ltd, Mumbai, India), sodium hydroxide (Sarabhai M. Chemicals, Baroda, India), 1,4-dioxacyclohexane (E Merk, Mumbai, India). 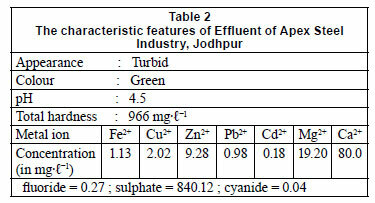 The reference solution and the effluent of Apex Steel Industry, Jodhpur (Rajasthan) characteristic features are presented in Tables 1 and 2, respectively. The reference solution was used to observe the removal efficiency of GSA resin in the experiment. Perkin-Elmer Model 2380 atomic absorption spectrometer (AAS) operating with an air-acetylene flame was used to analyse the concentration of metal ions in solutions. The metal ion concentration in the aqueous solution was determined by the AAS technique. Varian FTIR (Fourier transform infrared spectroscopy) instrument was used for determination of infrared (IR) spectrum using KBr pellets. FTIR spectral analysis of the resin was done in H+ form. Thermogravimetric analyser Model 951 was used for determination of the thermal stability of synthesised resin. Carlo Erba Model 1160 elemental analyser was used for determination of CHSO in the synthesised resin. To prepare the cation exchange resin based on guar gum powder, it was treated with sodium 1,2-epoxypropyl sulphonate, which was prepared by the reaction of epoxychloropropane with sodium bisulphite. This compound was previously synthesised by Singh et al. (1996). In the column experiment, a glass tube with 1.6 cm internal diameter and 20 cm height, packed with 9 cm of resin (8.5 g), was used. 50 mℓ of the reference metal ion solution was passed through the column at a flow rate of 2 mℓ·min-1. The flow rate was controlled by a peristaltic pump. The column was washed with 20 mℓ of deionised water and the washing was rejected. The metal ions were eluted quantitatively with different strengths of acids. The distribution coefficient (Kd) of metal ions on resins was determined by the batch method. In all cases, for the determination of Kd a 50 mℓ reference solution was taken in a conical flask and the pH was adjusted by acetic acid + sodium acetate and ammonium hydroxide + ammonium chloride. 20 mg of GSA resin were added to the solution and stirred on a magnetic stirrer for 2 h and the contents were equilibrated. The solution was filtered through Whatman No. 40 filter paper. The residue on the filter paper was equilibrated with 4 N HCl, and the solution was filtered through Whatman No. 42 filter paper. M is the weight of the resin taken (g). F = final concentration of metal ions in solution after equilibrium with resin. Resin capacity is usually expressed in terms of equivalents per litre (eq·ℓ-1) of resin or milliequivalents per dry gram of resin. The ion exchange capacity, which is generally taken as a measure of the hydrogen ion liberated by neutral salt to flow through the composite cation exchanger, was determined by standard column process. 1 g (dry mass) of the composite ion exchange material in H+ form was placed in a glass column with a glass wool support at the bottom. It was washed with demineralised water to remove any excess acid remaining on the particles. The hydrogen ions were eluted with 0.1 M solution of different alkali and alkaline earth salts. The flow rate was kept at 2 mℓ·min-1. The collected effluent was titrated against a standard solution of sodium hydroxide using phenolphthalein as an indicator. The hydrogen ions released were then calculated. FTIR spectrum of GSA resin shows a peak at 2 950 cm-1 which is attributed to C-H stretching vibration. A strong peak in the region 1 250-1 000 cm-1 denotes C-O stretching vibrations. The GSA resin displays asymmetric and symmetric S=O stretching frequencies in the region 1 350 -1 342 cm-1 and 1 165-1 150 cm-1. The frequency of S=O absorption is increased by the electronegative substitution. Another variable peak at 1 600-1 500 cm-1 is attributed to C-H bending. The spectra of polysaccharides are generally observed in the region 3 600 to 3 200 cm-1, which denotes O-H stretching frequencies (Rao, 1963). The IR spectrum of GSA resin is given in Fig. 2. The polymer sample was powdered to the same average mesh size and dried carefully in a vacuum desiccator. The boat was packed uniformly for analysis. For the dynamic measurement, the system was heated at a constant heating rate of 20ºC·min-1 under a static atmosphere until complete decomposition. The GSA resin was found to stable up to 401ºC, after which degradation was found to be rapid. 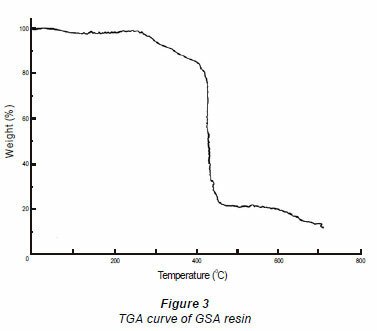 The TGA curve of GSA resin is shown in Fig. 3. The results of the elemental analysis were in good agreement with calculated value. The elemental analysis results were in support of the proposed structure of the resin presented in Fig. 1. The results of elemental analysis are given in Table 3. Higher swelling of resins may create problems in column operation. For high swelling resins additional allowances need to be made in the column design. Higher swelling means the solvent can easily penetrate in the resin phase and solute adsorption rate increases. In Indion 225H resin swelling was 14% (Gwale and Marathe, 2007) and in GSA resin swelling was 6.11%. A physical property of the ion exchange resins which changes with cross linkage is the moisture content of the resin. The amount of cross linking depends on the proportions of different monomers used in the polymerisation step. It is thus important to determine the moisture contents of the synthesised resins. 1 g of the resin in hydrogen form was taken and dried to a constant weight in a vacuum desiccator, at 85ºC overnight, and the resin was weighed. Moisture percentage was 14%. 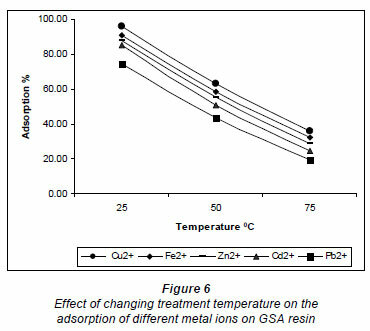 It was observed that the adsorbency of different metal ions on the GSA resin after 10 cycles (adsorption and desorption), and ion exchange capacities of resin, were almost constant. The adsorbed metal ions were easily desorbed by treatment with different strengths of acids, at room temperature. 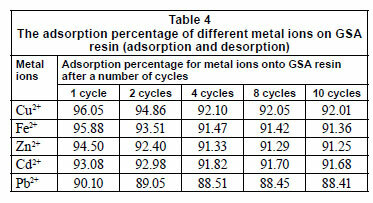 Table 4 shows the adsorbency of different metal ions on the GSA resin after 10 cycles (adsorption and desorption). The IEC of the dry GSA resin was found to be 9.50 meq·g-1. The pH has a strong effect on the distribution coefficient (Kd) of metal ions. 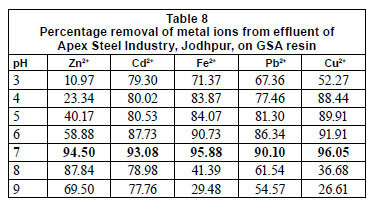 The distribution coefficients (Kd) of metal ions from the effluent of Apex Steel Industry, Jodhpur, are given in Table 5. The results show that the distribution coefficient value first increases, and then decreases, with increasing pH, and that these optimum results were obtained at pH 7.0. Differences in distribution coefficient, at the same pH, for different metal ions suggest a possible strategy for separation of these ions from their mixtures. Dowex 50W synthetic resin shows different Kd values at the same pH for Cu2+, Zn2+, Ni2+, Cd2+, and Pb2+ metal ions (Pehlivan and Altun, 2006). Metal sorption starts when the pH rises to the range where most acidic ion exchange sites start to exchange hydronium ion for metal, and the capacity reaches the maximum value in the pH range where all of the ion exchange sites take part in the reaction and the functional group is able to form a complex with the metal cations (Nenov and Bonev, 2010). The relative standard deviation values (RSD) of the optimum removal percentages of metal ions are shown in Table 6. All data represent the mean of 3 independent experiments. The metal ions were eluted quantitatively with different strengths of acids. Zn2+ was eluted with 0.05 N HCl; Fe2+ with 0.5 N HCl; Cu2+ with 1.5 N HCl; Pb2+ with 0.5 N HNO3 and Cd2+ was eluted with 1 N HNO3. The resin column was then washed thoroughly with demineralised water. These results are reported in Table 7. Dev and Roar (1998) modified amberlite XAD-4 with bis-(N,N- salicylidene)-1,3-propanediamine for the separation of Cu2+, Fe2+, Ni2+, Co2+, Zn2+, Hg2+ and Pb2+, and sorbed metals were eluted by 1 M HCl with a recovery of 97 to 100%. The pH is an important parameter for adsorption of metal ions from aqueous solution because it affects the solubility of the metal ions, concentration of the counter ions on the functional groups of the adsorbent and the degree of ionisation of the adsorbent during reaction. To examine the adsorption percentage of metal ions with pH, the pH was varied from 3.0 to 9.0. The uptake of free metal ions depends on pH; optimum adsorption of metal ions was observed at pH 7 and declined at higher pH. 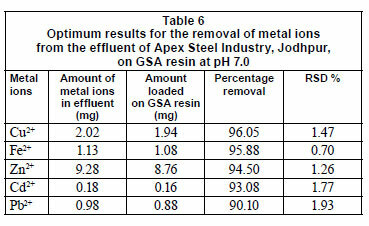 Adsorption of metal ions on GSA resin increased in the pH range from 3.0 to 7.0 (Table 8). The observed effect of pH on adsorption is due to different tendencies for chelate formation at different pH values. This can be related to differences in the stability of metal complexes formed on resin. Beyond pH 10.0, the insoluble metal ions start precipitating from the solution, making true sorption studies impossible. The effect of agitation speed on adsorption of metal ions was studied by varying the speed of agitation from 0 (without shaking) to 180 r·min-1, while keeping the optimum temperature (25ºC) and pH constant. It is clear from Fig. 4 that the adsorption of metal ions on ion exchange resin generally increased with increasing agitation speed. 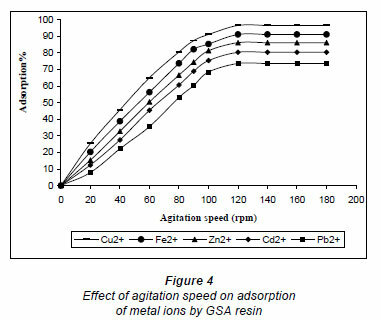 The adsorption of metal ions on GSA resin increased when agitation speed increased from 0 to 120 r·min-1. These results can be attributed to the fact that the increase in agitation speed improves the diffusion of metal ions towards the surface of the adsorbents. This also indicates that a shaking rate in the range 120-180 r·min-1 is sufficient to ensure that all of the surface binding sites are made readily available for metal ion uptake. The effect of external film diffusion on adsorption rate can then be assumed to not be significant. For convenience, agitation speed of 130 r·min-1 was selected as the optimum speed for GSA resin for removal of metal ions from effluent of Apex Steel Industry. These results are in close agreement with those reported by Jeon and Park (2005). The results for treatment time indicate that the adsorption of metal ions increased with an increase in contact time, before equilibrium is reached. It is clear from Fig. 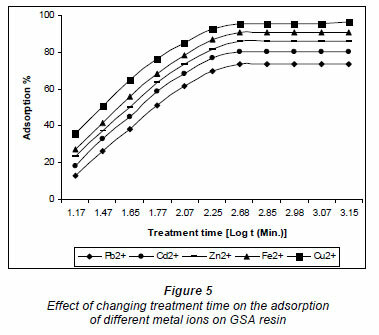 5 that adsorption of metal ions on GSA resin increased when contact time was increased from 30 to 240 min; optimum contact time for GSA adsorbent was found to be 240 min. Other parameters, such as pH of solution and agitation speed were kept optimum, while temperature was kept at 25ºC. Greater availability of sulphonic and hydroxyl functional groups on the surface of guar gum, which are required for interaction with metal ions, significantly improved the binding capacity and the process proceeded rapidly. This result is important, as equilibrium time is one of the important parameters for an economical wastewater treatment system. 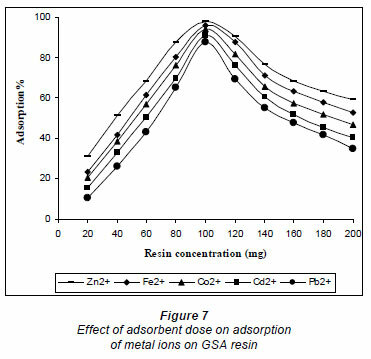 Figure 6 shows the effect of treatment temperature on the adsorption percentage of the metal ions on GSA resin. The adsorption percentage of metal ions decreases by increasing the treatment temperature from 25ºC to 75ºC at optimum treatment time of 4 h. This is due to the exothermic ion exchange reactions of divalent cations. The equilibrium constants for such reactions decrease with temperature and the reaction products were not favoured at high temperatures. This observation is in full agreement with the published results of Khalil and Farag (1998). The adsorption of metal ions was significantly influenced by the amount of GSA resin added. The amount of GSA added to the solution determined the number of binding sites available for adsorption. 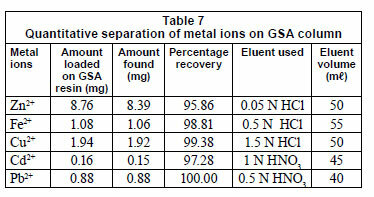 The effect of adsorbent dose on the amount of metal ion removed was studied by the application of varying GSA doses. The maximum adsorption by GSA was achieved with an adsorbent dose of 0.1 g, after which adsorption decreased until a dose of 0.2 g. The initial increase in adsorption of metal ions was due to the availability of more adsorption sites. On increasing the GSA concentration further, the binding of metal ions was steadily decreased. This effect might be attributed to overlapping or aggregation of adsorption sites of resin, resulting in a decrease in the total surface area of the adsorbent. These results are shown in Fig. 7. In the column experiment, the flow rate of the sample solution was an important parameter, not only affecting the recovery of metal ions but also controlling the time of analysis. Therefore, the effect of flow rate on removal of metal ions was investigated under the optimum conditions (pH, eluent, etc.) by passing 100 mℓ of sample solution through the micro column. The flow rates were adjusted in the range of 1.0-5.0 mℓ·min-1, controlled by a peristaltic pump. It was found that metal ions can be adsorbed quantitatively by GSA resin at a flow rate below 1.5 mℓ·min-1. Above 5 mℓ·min-1, the recovery was almost 93%. Flow rates lower than 1.0 mℓ·min-1 were not employed, in order to avoid the long extraction time. Thus, a flow rate of 2.0 mℓ·min-1 was selected for use throughout the column experiment. The adsorption behaviour of GSA resin towards Cu2+, Fe2+, Zn2+, Cd2+ and Pb2+ ions from aqueous solution was investigated under different conditions, including agitation speed, pH, treatment time and temperature. It was found that GSA resin is an effective adsorbent (almost 96%) for the removal of different toxic metal ions from the effluent of Apex Steel Industry, Jodhpur, India, in the following sequence, Cu2+> Fe2+> Zn2+ > Cd2+ > Pb2+. It has been found that the maximum percentage removals for Cu2+, Fe2+, Zn2+, Cd2+ and Pb2+ are 96.05%, 95.88%, 94.50%, 93.08% and 90.10% respectively. The optimum results were obtained at pH 7.0. GSA resin is thus recommended for treatment of effluents containing the aforementioned metal ions. The authors are thankful to the Head, Department of Chemistry, JNV University, Jodhpur, for providing all necessary facilities. DEV K and ROAR GN (1998) Synthesis and analytical properties of a chelating resin functionalised with bis-(N, N′-salicylidene) 1, 3-propanediamine ligands. Talanta 43(3)451-457. KOZLOWSKI CA, WALKOWIAK TW and KOZIOL JJ (2005) Application of hydrophobic β-cyclodextrin polymer in separation of metal ions by plasticized membranes. Sep. Purif. Technol. 46(3)136-144. Received 25 October 2010; accepted in revised form 30 May 2011.